We have a new release of SongKong, version 3.16 ! Usually SongKong can be run on any number of files without memory issues, but badly behaved images can cause a memory issue. SongKong was not recovering from this error and if the memory issue did reoccur when loading songs SongKong was not reporting the error correctly, this is now resolved. We have added a new option for reports. This option can be used to prevent the report being opened automatically, the report is still created and can be opened immediately after processing from the summary panel or from the Reports menu. Once SongKong has finished a task such as Fix Songs it now automatically closes the progress dialog, previously it had to be manually dismissed. The dialogs have been tidied up so that they do not show Discogs counters when the customer is not trying to match songs to Discogs. In the past there have been two significant problems with trying to link Discogs releases to MusicBrainz release. Firstly, it was difficult to Discogs release that can be linked to MusicBrainz but aren't already. You could browse an artist releases on Discogs but there is no indication on the Discogs site as to which ones are already linked to a MusicBrainz release. 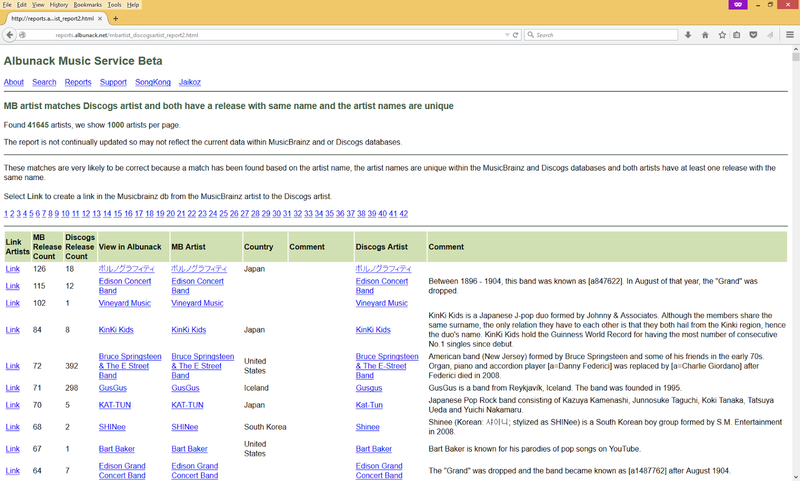 You can check whether an individual release on MusicBrainz is linked to the Discogs but you cannot filter a list of releases by whether or not they are already linked. And when popular artists can have hundreds of Discogs releases linked to a single master, and even moderately popular artists can often have more than thirty it is difficult to find the correct release to link to if any. Working out the best match is difficult when having to consider and compare differences and matches in metadata such as track lists, catalogue nos, barcodes, country of release and record labels. Secondly you have to actually add the link. Linking the release is not so difficult but when the Discogs release contains extra information that the MusicBrainz release does not have, wouldn't it be good to get that data in as well, but adding that extra data for more than a few releases at a time is time-consuming. Information from MusicBrainz and Discogs is combined on a single page. Release group, Release and Track listings are all available on a single page. Potential matches identified by Albunack are shown. When you click on the link button Albunack not only links the two releases but adds additional data such as barcodes and catalogue nos, you simply have to check the data and then click submit. 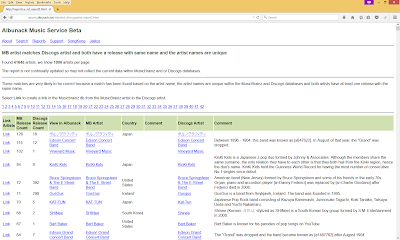 The JThink Music Server is a dedicated server that contains MusicBrainz and Discogs data, and is what Jaikoz and SongKong use for their automatic matching. Albunack is the public face of the music server and can be used to browse combined MusicBrainz/Discogs discographies for almost any artist. If SongKong is not finding a match when you think it should, it is probably easier to check on Albunack instead of MusicBrainz or Discogs. Although note Albunack doesn't currently show collaborations or Various Artist releases (although they are in the JThink Music Server). this gives a nice overview on how to navigate around an Albunack discography. Firstly this includes modifications required to work with cover art newly added to Discogs in the last two months, this is required due to a change in how Discogs provides their cover art data. Then we have fixed a problem matching song title and track total when matching multi-disc Discogs releases. We recommend you update to this latest version of SongKong and then run Fix Songs over your collection with the For Songs Already Matched to MusicBrainz releases option set to Update Metadata and Filename Only. This will fix any data that may have been incorrectly added in earlier releases and will also updated your previously matched songs the very latest data added to MusicBrainz and Discogs.